Goa seems to be bursting with people who are making some innovative, interesting as well as traditional Goan desserts. Here are our favourite ones. Serradurra is a traditional Portuguese dessert, and is making a comeback of sorts. Not available everywhere, but if you know where to go looking then you will want it every day. Made with fresh cream and Milkmaid, which is whipped to perfection, then dusted with a crumble of Cashew nuts & Marie biscuits. The best ones so far we have found are at Maracas in Porvorim or then Bhatti Village. Bebinca is another traditional Goan Portuguese dessert that is common and available pretty much everywhere. From super markets shelves to restaurants, to home makers, one can buy or order one easily. Best had a little warmed up and with a dollop of ice cream. Martin’s Corner or Viva Panjim serve homemade Bebinca that is definitely to die for. What’s not to love about a fresh cream filled pastry topped with chocolate? And Jilla Bakery in Loutolim makes the perfect ones. Of course, go early as they tend to get sold out pretty early. Churros are deep-fried, sprinkled with sugar and usually accompanied with a rich chocolate sauce: little sticks of heaven. Very common in Spain and Latin America, now they are even available in Goa courtesy Habanero. If gelatos are your thing, then head to Cream Choc in Anjuna. Owned by an Italian, who makes them all in-house, this place is the go-to place for all of the above and even sorbets. Be it their buttered or salted caramel or cherry and Belgian chocolate, you can try a new flavour every day and still come back for more. And you can taste them before you buy them here. A gooey chocolate fondant baked to perfection and served with some ice cream is why you need to go to Babazin. We have yet to eat a tastier or more deliciously moist fondant in Goa. So the next time you are in Goa, head there and order their choco lava cake with ice cream. A doughnut that is whole, so no wastage and is filled with yummy custard and then topped with powdered sugar is definitely how I like mine. And Baker’s Street Café in Porvorim serves them exactly like that. Of course, again this is a local favourite, so tends to get sold out early. If mango panacotta gets you weak in the knees then head on to Gunpowder. Yummy fresh mango flavours coupled with sweetened cream make this a perfect summery day dessert. Or well, even a perfect night time dessert. 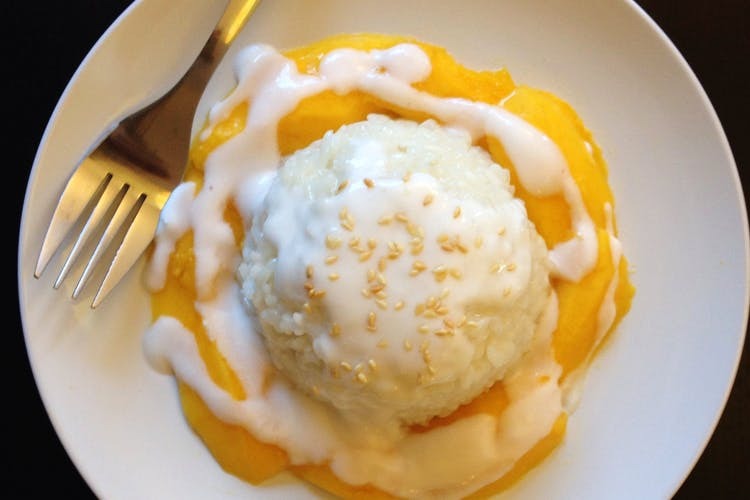 The Thai dessert sticky mango rice is another favourite of ours. There is mango, jaggery, coconut milk and rice, making it all such a perfect combination. Lotus Blossom in Anjuna makes a mean one in Goa. Take alcohol, take ice creams and mix them up and you have my perfect cocktail. Looks like The Icecreamist had the same idea. What we got were delicious flavours like his strawberry, basil and vodka sorbet or the whiskey and brandy-flavoured ice creams. Already launched in Goa, we got to try them at his workshop in Assagaon and you will find them in Goa’s popular restaurants like Cantare.